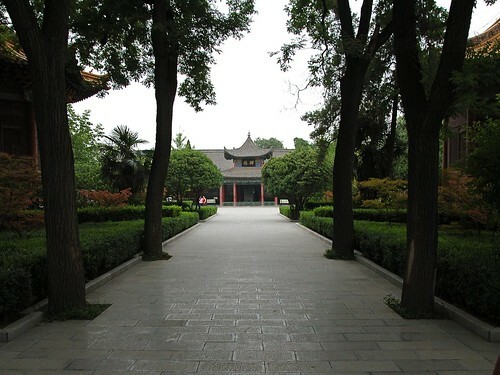 The second part of our Xi’an trip consisted of further inquiry into China’s cultural history, since when it comes to China’s cultural history, Xi’an is where it’s at. Xi’an is also where George is at, so we were able to spend some more time with him. First we headed off in the morning to check out the city’s Museum of History and the Museum of Stone Tablets (Bei4ling2). Sidenote: There’s something about this blog that I should point out. Some have remarked that my posts seem rather short and that I only seem to include one picture per post. That’s because posts that you see on my main page are actually only previews. On the bottom of each those postings, there’s a link that says “Keep Reading” – you have to click that link to view the entire entry. The link for this particular post appears right below this sentence. See? First we visited the Museum of History. 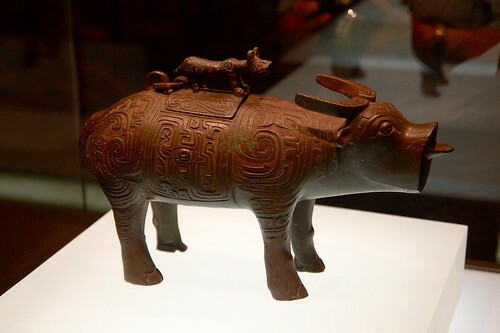 A rather cool looking but unwieldy musical instrument played in early China. 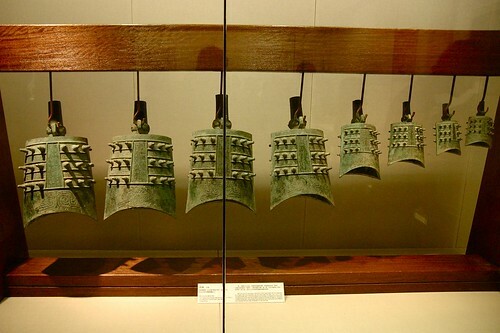 It consists of eight bells total that make up five distinct notes, with four bells allocated to the deepest note. Hm? The tour guide didn’t know why this was the case either. Here’s a rather comical figure. It’s a little tiger on top of a big ox. Notice that size doesn’t seem to matter here as the ox is wearing a panicked expression on his face. Zhang Qian. This man is the man. 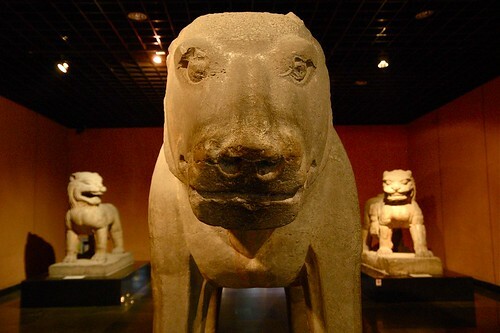 He was the imperial official sent by the emperor during the Han dynasty to open up a route for the Silk Road. On his journey, he was captured by the huns(?) and held captive for 10 years. Eventually he was able to escape, and proceeded to accomplish his mission within three years. 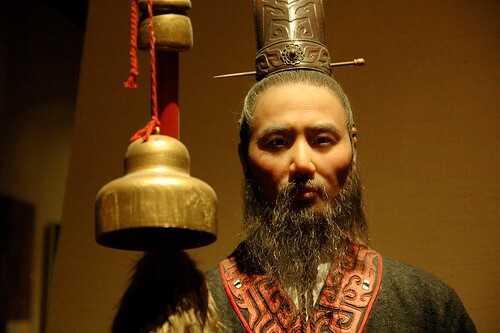 Thus, he returned to China a hero, 13 years after he had first embarked on his journey. No, I didn’t somehow manage to get a picture of him, only of this life-sized clump of wax that looks a lot like him. Face to face with this fella. Notice the two buff lions in the background. Together they make quite the beastly trio. Inside the walls of the Museum of Stone Tablets. The first interesting point to note here is the actual museum itself – it’s about 900 years old! Of course, there’s been maintenance and repair work done as needed over time, but the bricks of the walls and buildings themselves were largely laid almost a millennium ago. Crazy huh? 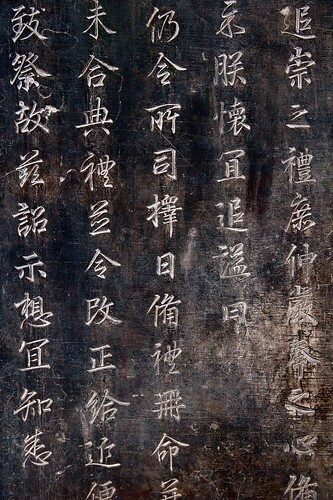 This museum contains hundreds of these large (around 8 feet tall) stone tablets engraved with chinese characters. 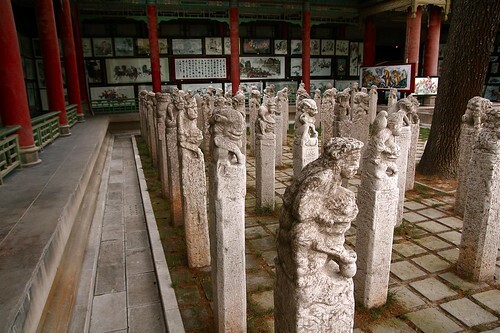 Each of them is hand carved by artisans, and many date back thousands of years. Impressive. 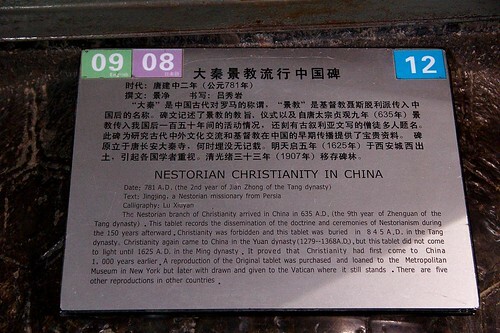 On Jorge’s tip, we found this tablet that documented the spread of Christianity in China during the 7th century, far before the rise of western political economy. It is the artifact that proved to historians that the gospel had been active in China many years earlier than anyone had previously thought (though it was banned later on during the Tang Dynasty). Before we left, P. Manny and Sunny had pointed out that China, in so many ways, is such a privileged nation. So many people throughout history, from the likes of CT Studd to many other unknown/obscure individuals, have made personal sacrifices to bring the good news to China. Now, through the lens of history, you can see how events today actually fit into a much larger story, a story of God’s persistent heart for a people. After getting off work in the early afternoon, George took us out to another delicious place with Xi’an style food. We had the famous dumplings there, along with a host of other tasty snacks. 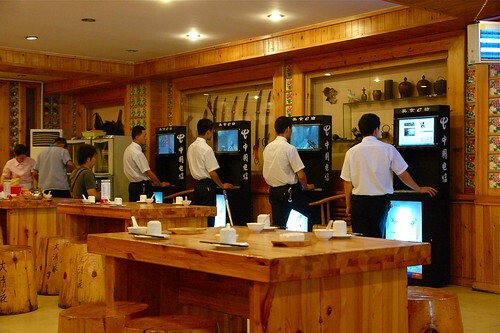 The restaurant had a very distinctive Asian wood decor, but in one corner they provide these high-tech internet stations, free of charge for restaurant patrons. As you can see on this particular afternoon, the stations are actually being utilized by the employees, for uh… Counterstrike? 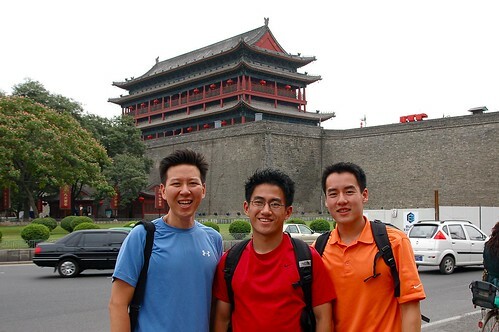 With our stomachs filled and hearts contented, we decided to take a stroll out to the ancient city wall of Xi’an. This wall completely seals off a significant portion of the city in a rectangle. The wall itself is actually hundreds of years old, and is very well preserved. See? We’re standing on it! 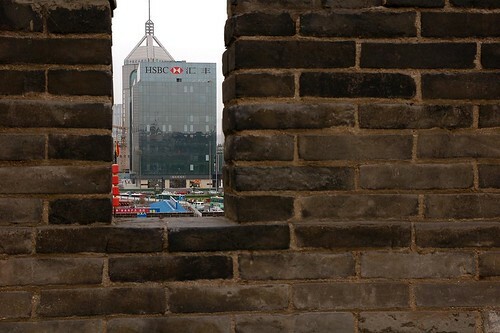 A juxtaposition of old and new: the city wall dates back hundreds of years to the early Ming Dynasty, but just adjacent to it stands HSBC, a shimmering symbol of the new age of globalization. This is something that has become somewhat of a recurring theme on our China trip. Everywhere we go, we visit these monoliths of ancient civilization, seemingly misplaced in a world full of new buildings, new development. Places that were once deemed forbidden to all except Imperial officials are now inundated with people of all sorts. It’s a sight you never see back in America given its comparatively meager 200+ year history. This post was written a while ago, but for some reason I wasn’t able to log into my wordpress account for the past day or so to post. Thus, the next post will probably come a lot sooner than usual. It’s about our exciting climb up Huashan, the mountain known to be the hardest hike in all China. Stay tuned!